We emphasize fast shipping at reasonable prices and are more than happy to offer FREE SHIPPING on most US orders of more than $50.00 to physical addresses within the contiguous 48 states. We generally ship your order within one business day. We ship most orders via FedEx Ground Delivery or US Postal Service, depending on destination and which method is most efficient. Our Free Shipping offer is subject to end at any time and excludes selected items such as kitchen carts, butcher blocks, baker's racks, etc. Shipping and Handling for items that do not qualify for Free Shipping are noted in the relevant item descriptions. Upgraded Shipping - We are happy to offer upgraded shipping options should you need your order faster than the normal free shipping method. Simply add the items to you cart and click calculate to see the various shipping options and fees. Please note that the expedited shipping rates are weight-based. Shipping Time - We use FedEx Ground for most orders over 1 pound. 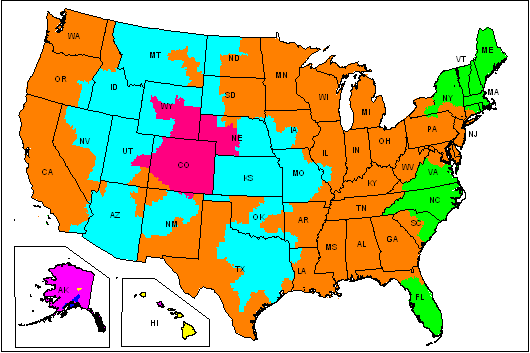 Our location in Colorado allows us to reach most locations in the contiguous US within three business days. Refer to the map below to estimate the delivery time.